Taken on the morning of 1st September 2015. There are days when our hearts are wrenched with grief and giving in to despair becomes the easier thing to do, then there are bad days and not so okay days. Then there are really awesome days that fill our hearts with delight, and we can't help but do silly elephant dances, days like today, days like this, when elephants roam free and wild on the red sands of Tsavo, this is our pride, joy, our inspiration and motivation not only to save this amazing species that grace our majestic earth, but also to restore them to their numbers that they once were and to ensure safe, wild and healthy environments that they can successfully thrive in. Do support the efforts of Wildlife Works and Ulinzi Africa Foundation so we can forever have free, wild, elephants roaming on the vast plains of Africa. *Please share this post and spread the joy! 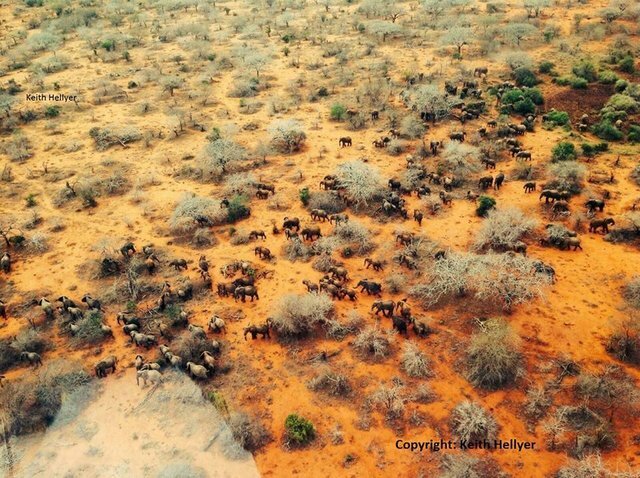 Photo credits: Keith Hellyer - taken on 1.09.2015 morning on his daily aerial patrols in the Tsavo Conservation Area.